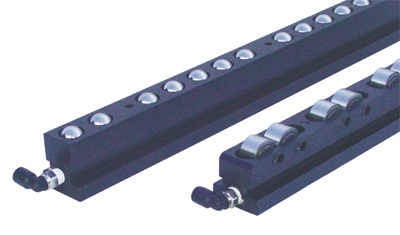 Pacesetter Systems, Inc., Valencia, CA, a manufacturer of quick-die-change systems and metal-stamping accessories, introduces its Air Glide heavy-duty pneumatic die lifters, available with ball bearings for multi-directional movement or cylindrical bearings for in-line movement. Both styles feature extra-large precision-ground bearings and high-quality O-ring seals to optimize lifting efficiency and durability. With Air Glide heavy-duty die lifters, it takes only 40 lb. of force to move a typical 2000-lb. die. Air Glide lifters use standard shop air pressure and install easily in standard ANSI T-slots. Because they have no internal air bags or bladders to corrode and crack, the rollers reportedly are more resistant than other pneumatic rollers to the harsh chemicals and lubricants used in metal stamping. The die lifters are available from stock in 5⁄8-, 3⁄4- and 1-in. sizes in lengths up 72 in. ; custom lengths and metric sizes also are available.